Editor's note: This post is best enjoyed while listening to the music found here. A flower pot to the head sends MacGyver back to 7th century Britain where he meets Merlin, King Arthur, and Sir Gallahad. He and Merlin set off on a quest to rescue Gallahad's maiden, Cecilia, from a castle belonging to Arthur's evil sister, Morgana. MacGyver also intends to clear the name of his ancestor, Ian M'iver, whose son has the first name as MacGyver himself. The revelation of MacGyver 's first name, the third greatest moment in series history. Much more on this below. You'd think that Morgana, a powerful woman with designs of taking over the world, would be surrounded by more than just a couple of dopey guards. Similarly, the castle special effects are somewhat cheesy and further add to the low budget feel. But given that the budget was probably pretty low at this point of the series compared to early season episodes, I won't quibble. Creates a kite out of Cecilia's dress and gets it afloat by attaching it to a mini hydrogen balloon. Ties the kite to the cell lock and then also ties the kite to Merlin's robe which he throws into Morgana's gunpowder lab. When lightning strikes the kite, the door is thrust open and the lab explodes. This is an awesome MacGyverism and is worthy of being on the list of the all-time greatest. An intriguing opening in the genealogist's shop as the genealogist tells MacGyver and Pete that the "M'Iver" clan goes all the way back to the 7th century. He talks of Ian M'Iver who "fell prey to great evil" and died in a dungeon, and he says how Ian gave his son the same first name that MacGyver has now. What a way to set the scene and foreshadow the episode. I'm hooked! Then we see MacGyver hit in the head with a flower pot and transported back to medieval times to restore his family's honor in a wild, amazingly creative, dreamlike fantasy. Once again, I'm in! I won't say, "I don't understand how people wouldn't like this concept" because I know there are many who don't like this 2-parter in general, but I think it's an inspired idea. And it gets off to a great start as MacGyver has a joust with Duncan, played by Christopher Neame (from Deathlock and Legend of the Holy Rose) who is brilliant as ever. Great scene as Merlin and MacGyver have a "magic duel" that ends with MacGyver ruining Merlin's trick. I love the Merlin character, by the way. Time Winters, who I just talked to about this episode, is phenomenal in the role, and I enjoy his animosity toward MacGyver initially and how it slowly turns into a grudging respect as the episode continues along. A surprisingly powerful scene between MacGyver and Pete (aka King Arthur) as Pete bestows knighthood on him. I say "surprisingly" because who would have thought going into this dreamlike fantasy that there would be real moments of poignancy and depth? The moment above is helped immensely by Ken Harrison's theme for the episode, which happens to be my favorite Harrison theme and one of my favorite from the series. 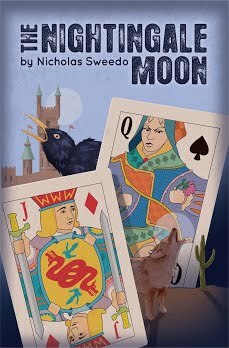 In my conversation with Harrison, I mentioned how when I was writing the medieval scenes in my novel The Nightingale Moon, the theme was running through my head constantly. Fantastic stuff. The "who poisoned the king" angle actually turns into a good little mystery. And while one may wonder why Arthur's royal palace is in the middle of a wooded field, the acting in these scenes is way too good to not enjoy these scenes. This whole episode could have easily become overly cheesy, but it is anything but. Pete's royal seal reminds me a bit of a Ring Pop. The scene where Merlin is almost burned at the stake is impressively filmed. And MacGyver conjures up a pretty sweet homemade fire extinguisher, and I like how he sprays Merlin in addition to the fire. Not sure why none of the knights chase after Duncan as he is riding away. "Halt, we must advise our king," Hector says in the calmest way possible. There's time for that later, Hector. Go after him! The town crier is pretty cool, and I like how he sings about "purging the M'iver name." Now on to Part 2, where things really get moving! Not sure why MacGyver gets so annoyed with Merlin after he crawls off the plank. "Will you tell me when you're going to move like that?" and "You just about dumped me!" he exclaims. But all Merlin did was crawl across, so I don't know why MacGyver's got his undies all in a bunch. Maybe RDA was working off some frustration - if you missed my conversation with Time Winters (Merlin), read it and you'll see what I'm talking about. Speaking of Time Winters, I mentioned in my conversation with him how the makeup department did an amazing job. He looks much older than he really was at the time (35 years old). 9:41 mark of Part 2: "I do not want your job. Be-leeeeve me!" ~MacGyver. RDA was really getting into this! Great MacGyverism as he turns the king's amulet into a dog whistle. I like the pep talk that MacGyver gives to Merlin before they head into the castle, and then I also like the implication of Merlin as being the father of all lock pickers. The gunpowder story line (i.e. the development of the first gun) is great, and it's a clever way of playing on MacGyver's aversion to guns. An amazing scene between MacGyver and his ancestor, Ian . What a moment. All right, we've arrived at what is now the greatest moment in MacGyver history (and will be #3 by the time the countdown is over) - the revelation of his first name. My God, what a freaking amazing moment. Given that I started watching the series while it was in Season 6, my experience with watching live episodes was somewhat limited, and I don't have a ton of stories or memories like Mark does about what happened when I saw an episode for the first time. There are a few exceptions, though. I talked about how the cable tragically went out during Strictly Business. And then this episode, I remember being over the moon excited for. I mean, how could you not be? They were going to reveal MacGyver's first name! It was a brilliant idea to reveal the name, and the name itself was a great choice by RDA. Highlander recently shared an interview with Regis and Kathie Lee where RDA talks about how he actually saw the name at a policeman's ball on a big screen several years prior and "just knew" that it was the name for MacGyver. He then goes on to provide hints: it's 5 letters, ends in s, and is old-fashioned. Really interesting interview. Back to the moment: it's just brilliant as the name represents a link to his ancestors and also how he has to use a MacGyverism (creating a mirror) to read the message on the prison wall that contains the name. They strung us along and made us wait for it, first for all of Part I and then through most of the second part. Then even as the moment arrives, we still have to wait for MacGyver to read the message which feels like an eternity, and then finally he gets to the end and we see it burning in fire: "Angus." Meanwhile, we have Ken Harrison's astoundingly brilliant score for the ages playing continuously. What a glorious moment in television history. I feel like I have the energy to go run 26 miles. And incidentally, my cat's name is Angus. That name was the name he was given by the shelter before we got him, and I took it as a sign that he was the right cat. And he certainly turned out to be the right cat, and he's provided comfort by sitting on my lap through many of these reviews. In fact, I've given him the middle name of "MacGyver" and sometimes will call him "Angus MacGyver Sweedo." The things you learn from this blog. MacGyver drops more unbelievable knowledge as he asks Merlin for "spirit of hartshorn," knowing that it is the 7th century word for ammonia. It's almost as impressive as the time that he drops a Guan Di / Chinese war god reference during Murderer's Sky. Morgana is an awesome villain played perfectly by Robin Strasser. Great moment as the lab blows up and she piercingly screams, "NO! MY RESEARCH!" I've said pretty much all there is to say about this masterpiece, but in summary, it's the most creative plot in the series (written by frequent guest star John Considine), and the whole thing is tied togethter beautifully with MacGyver clearing his family name and with the appearances at the end by Pete (King Arthur), the married couple (Gallahad and Cecilia), and the ambulance tech (Merlin). It's fun as heck to watch, and the first name reveal makes this episode an all-time classic. Now for a word on Season 7. True, it may be my least favorite season. Yes, there may have been some episodes that gave new meaning to the word "catastrophic." Sure, RDA may have often been grumpy in several scenes. But there's still a ton of fun to be had, and the worst season of MacGyver still beats the best season of most other shows, so Season 7, I support you! Grrrr...I knew you were gonna post in the middle of the night again and force me to stay up way past my bedtime to write a response! I can't post at work but waiting nearly 24 hours to respond isn't an option either! These midnight postings on weeknights are very bad for my sanity! And my sanity wasn't in a good place leading up to this episode either. A duo of some of my least favorite "MacGyver" episodes ever preceded this one and the show just seemed off generally in season 7. I knew there was a two-part medieval fantasy episode on the horizon and while that sounded fun, I wasn't a big fan of the Western dream episodes (especially the second one!) so there was cause for concern. Adding to that concern, when they showed the "next on MacGyver" feature on ABC in October 1991 I'll confess this episode looked pretty silly. It kind of felt my favorite show was burning out. Little could I have guessed when I watched this episode that it would feature the only truly inspired storytelling from the seventh season. I can't connect with any "dream episode" like I can with conventional episodes so this one isn't quite as high on my list as yours, but it's nonetheless a first-rate episode that stands out as the best example I've seen of a dream sequence episode on any series. The budget for those final "MacGyver" episodes was as far as you can get from being "pretty low" as you surmised in your lowlight. After moving back to LA for season 7, the cost ballooned to an unprecedented-for-its-time $1.5 million per episode, and in that "Regis and Kathie Lee" feature that Highlander linked us to RDA said they ran $300,000 overbudget on this one. This speaks to the overall hyperinflation of TV production costs between 1985 and 1991 as I agree this one wasn't the most bedazzling production the show put on. Honestly though, it wasn't bad for 1991, and some of the early CGI in play here was no worse than the stuff from $200 million movies today that audiences are supposed to be in awe over. Criticisms aside, thanks to excellent set designs, attention to detail in the production, entertaining characters, clever writing, and a strong juxtaposition between the past and present, this one still had the most theatrical look of any season 7 episodes. The layout of MacGyver's ethnic history at the genealogy office, and the prospect of finally learning MacGyver's first name, effectively set the mood for the episode and the rest of Part 1 delivered with a consistently entertaining introduction of MacGyver to the Knights of the Round Table in King Arthur's Court. John Considine did an outstanding job with the scriptwriting of this episode, in both parts. The weakest link for me was the mystery surrounding King Arthur's poisoning, which was very obviously commandeered by overeager Duncan, but even that eventuated nicely with the scene in which MacGyver unleashes the King's "seal of approval" (agreed that it looks like a ring pop) to let the other knights know Duncan is the guilty party. The rivalry between MacGyver and the jealous Merlin the Magician was executed brilliantly, and the cliffhanger over the molten pit was gripping and intense. I think we were to believe Merlin gave that trapdoor a nudge with his foot to throw MacGyver off-balance, triggering the annoyed response. I didn't realize you were staying up later for the blog, I thought you were just a night owl. I'll see if I can avoid any 11 PM or later weekday posts for my last 5! Interesting comments about the budget - I guess I incorrectly assumed that since they had been unreasonably high in the first season that they were much lower by the end of the series. As you said, maybe with inflation the real value was lower than it may have seemed. I would have loved to get a hold of Considine to hear what went into the writing of this and to just talk about MacGyver in general. I tried getting a hold of him but am not 100% sure he saw my message. I'm a night owl but I try to wind down around 11 so I can get to bed by midnight. When I see there's a new "MacGyver Project" review up at 11:15, that definitely derails those plans though! Feel free to post whenever is most convenient for you though...I'll just have to adjust. The biggest reason the budget went so high for season 7 was they moved back to L.A. One of the many benefits of producing in Vancouver for four years was that they could do much more for less money. Returning to spendy L.A. required a bigger weekly budget where they nonetheless got less bang for their buck. The inflation of TV production costs in LA between 1985 and 1991 was quite a bit higher than general inflation. You could make a much more impressive show on $1 million in 1985 than $1.5 million could get you in 1991. Too bad you couldn't get a hold of Considine as I bet he'd be a great interview all around. He's gotta be well into his 80s by now as well. As long as the odds were to pull this story off, the high bar set in part one actually got surpassed in part two. Every logistical element from part one was shrewdly deployed as a mechanism for escape in part two, ranging from the king's amulet to Merlin's wine bottle to the use of the term "pivot point". The opening escape scene from above the molten pit was both exciting and comical, raising the stakes of Merlin's rivalry with MacGyver. Turning the king's amulet into a dog whistle and using the gunpowder from Morgana's lab to unveil Ian M'Iver's coded message in the dungeon walls all helped to contribute to this creative masterpiece. Even the Scottish origin of MacGyver's long-hidden first name was worth seven seasons of hype and the uber-dramatic context in which it was revealed. Robin Strasser's performance as Morgana was deliciously over-the-top, and her execution of the snoozing guard was darkly hilarious. But the episode's creative peak came at the climax with the ingenius recreation of Benjamin Franklin's lightning trick that ultimately blew up Morgana's gunpowder lab. This may well go down as my favorite MacGyverism of all-time, despite the mediocre special effects. Even the closing scene, where MacGyver awoke to find the real-life characters paralleling those from his King Arthur fantasy, impressed. But more than any other "MacGyver" episode, this one has held up poorly with nearly everybody that reviewed the DVDs nine years ago. I can't understand why. The episode was universally praised for being clever and well-executed back in 1991, but the DVD reviews mercilessly panned it as one of the series' weakest offerings. Were they watching the same show I was? Because this was pretty well-done TV and I think it holds up well save for the special effects. I really don't get the hate for this episode but I suspect you'll get some even from regular "MacGyver Project" posters based on early indications. I won't be one of the haters though. I ranked Part 1 as my #30 and Part 2 as my #27. And while you had "Strictly Business" ripped away from you on the original viewing, I had Part 1 of "Good Knight, MacGyver", even though my uncle taped it for me. What happened? The legendary "Halloween storm of 1991" which will live in infamy in the Upper Midwest for as long as records are kept. Only four days removed from the Minnesota Twins winning the greatest World Series of all-time, came a blizzard that dropped 25+ inches of snow through the majority of Minnesota and portions of Iowa, undoubtedly into Wisconsin as well. But the snow didn't hit my corner of Minnesota....ice did. We're talking a Category 10 ice storm where a downpour of rain met plummeting temps and turned the entire area into a scene from the Ice World in Super Mario Bros. 3. The power went out Friday morning (November 1) and stayed on till Thursday night (November 7). My uncle, who lived in town and had power, taped "MacGyver" for me so I did get to watch it but I was late to the party, at least for Part 1. When you mentioned how an outage kept you from watching a late season episode, I thought for sure you were talking about this one....with the same storm cell that hit Minnesota on October 31 reaching the Lehigh Valley in some form or another on November 4. Do you agree that his name relevation was an all-time great moment? It's hard to think of anything else to compare it to, in that there's likely to never be a show again where you dramatically learn the character's name after 7 years. As tragic as it was to miss out on Strictly Business when it aired live, missing Part 2 of this episode would have been way worse. I can't even imagine. I've found that this episode resonates with most fans but perhaps it doesn't hold up as well for some as it seems to have its share of harsh critics. 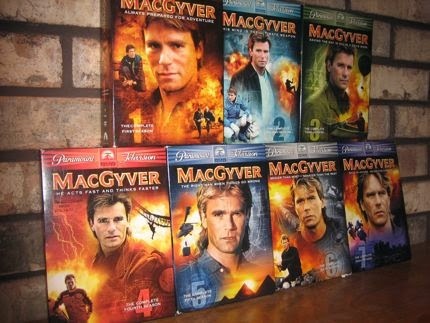 When "MacGyver" DVDs came out in 2005-2006, I searched the web for every site that reviewed DVDs to read up on their reviews. "MacGyver" always got a mixed bag, which was not unexpected as there were a lot of people attempting to scrutinize the series as they would "The Sopranos" or some other highly celebrated made-for-cable series rather than as a product of its time. I interacted with a few of the more professional reviewers who gave the show generally strong marks. One of the best was David Johnson of DVD Verdict who reviewed six out of seven seasons on DVD. I was kind of surprised by the particularly harsh review he gave this episode, but he was not alone. I don't think I ran into a single positive review, which was diametrically opposed to the acclaim it got back in 1991. And yes I thought the reveal of the first name was epic. I had a bet with my mom and got $5 richer when her prediction of what his first name didn't come to fruition. I'll tell that story in full below in response to Highlander's commentary. I can't remember how far into "Seinfeld" it was before Kramer's first name ("Cosmo") was revealed, but they kept his first name under wraps for a lengthy expanse of the series just like "MacGyver" did. One more word of praise....for Ken Harrison's outstanding musical score. The high point for me was the scene was the page was killed, with an emotional flourish that fit MacGyver's despair. Great music all around. In general the show was not at the top of its game in season 7, but Ken Harrison's music was still first-rate in those late episodes. I keep forgetting little things....such as the fact that I named a gold cat we had Angus as well. This was back in 1992 though, right after the "MacGyver" revelation. Go to bed! I'm about to. We can talk more about the episode tomorrow. My cat is black, which is probably why he got the name Angus. He's got a great heart - his main issue when we got him was that he chewed wires (which actually was a pretty big issue). That's probably why he was given up initially. Pretty much all the wires in the house have electrical tape on them from his chewing. Yeah definitely the cat for you if he was named Angus when you picked him up! Pretty amazing he's still alive with his wire-chewing pastime. I've known some dogs who died from that particular hobby. Fortunately he's toned it down considerable the last year or two, but we've gone through at least 3 macbook chargers as a result of the little rascal. Yeah - I think Merlin did something that tipped the wobbly trap door and almost dumped Mac into the fiery lava pit and that's what irked him, b/c Mac had to re-balance before he could climb to safety. I like this episode - despite having the 'man, why does everyone have to do a "Connecticut Yankee" ep?' feeling I got from it - because they did such a lovely job with the storytelling. And I wanted to know what they'd picked as Mac's first name. Actually - after that R&KL interview - I sat down w/ this baby name book we had lying about looking at all the names that fit RDA's clues... The 1st or 2nd one was Angus (what w/ it starting w/ 'a' and all) and I had this instinctual feeling that that was the right name, but I wen through the rest of the book. Turns out - my gut was right on this one. Colm Meaney's line at the beginning "Aye, do you think I'm a nincompoop?" cracks me up every time he says it. Colm is better known as Chief O'Brien from Star Trek: DS9. That's pretty cool that you guessed the name from the interview. He really did give too many hints - I wonder if the producers got on him a bit for that! I love that he was the one to come up with the name, and it's a good choice given that it's not too common (and thus makes sense that he would want to hide it). It also relates well to the Scottish Highlands locale of the castle in the episode. I remember when I was a kid and first started watching, it wasn't clear to me if MacGyver was his first or last name. His hints were still not very 'narrowing' - there are a LOT of names that are 5 letters that end with 's'. I had a really long list when I pulled 'em all out of the book. And even then, I knew there was a slight possibility that it was a name that had fallen so far out of favor it wasn't even in a baby name book anymore. But, something about 'Angus' just sort of clicked. My dad's name is Bernard, and his nickname is "Bud", so based on Grandpa Harry's repeated references to MacGyver as "Bud", my mom made a $5 bet with me that MacGyver's first name would be Bernard. I got $5 richer on November 11, 1991. I didn't see the Regis and Kathie Lee interview live or I may have guessed it based on the clues given....I only heard about the interview the next day from someone who did....along with confirmation that the series was in its final season. I like the name Bernard - that's the name I chose for myself as my alter ego in junior high French class (when you pick other names for the teacher to call you). That's cool that your dad was nicknamed "Bud," and that's awesome that your Mom not only bet with you but also paid up! I had no idea Bernard had French origins. My dad is certainly not French (we're of Norwegian stock like so many Minnesotans). I was in German class and my alter ego was "Otto". I kicked myself later for not choose "Ludwig", in honor of former "MacGyver" producer Jerry Ludwig! I'm not sure if it has French origins but it at least was an option to choose from in 8th grade French class. Maybe its because of the dream sequence, maybe because its difficult not to think of ‘Monty Python and the Holy Grail’, maybe it’s a Brit thing……Sorry Nick and Mark, I don’t ‘hate’ this one (there are very few episodes that I actively dislike) but I just can’t really take to it a.nd I'm pretty sure I'm in a minority of fans, as opposed to DVD reviewers. No one can trace their ancestry back beyond written records and why did MacGyver’s parents call him Angus if they weren’t aware of the historical link? Best not to ask too many questions. I have to agree. there's some great creative ideas and plenty to like over the two-parter; MacGyver’s lasso work, being let loose in Merlin’s lab, working out the poison , knowing about Vanadium ( although I’m not sure he’s right about its Scottish origins) and the old names for the elements, the exciting lava pit escape, his kindness to Merlin and of course, the name reveal and the dramatic ‘death’ scene. And MacGyver certainly gets the coolest knights’ costume. However, besides the theme itself, I’m not at all sure about Pete as King Arthur, Galahad’s terrible blond wig, the ‘tunnel’ to Caledonia, the ‘ferocious’ dog with the hat, the castle scenes with Morgana as a pantomime villain and the idiot guards with their crazy accents (why didn’t MacGyver just take out the hopeless guard himself? ), the unpleasant, yet supposedly amusing, killing of the guard with gunpowder experiment….. I could go on. MacGyver/RDA seems to spend a substantial amount of the time looking either bemused or terrified, a trait which annoyingly crept into many of the late episodes. It’s great that your cat’s called Angus. it’s the perfect name for MacGyver (great work by RDA) and I agree that the name reveal is a brilliant concept but I guess the scene wasn’t quite as exciting for me because I only came to the later episodes via DVD and knew the name by then. I’ve seen this a couple of times now, fast-forwarded a few scenes and won’t be rushing to watch it again apart from maybe seeing some of the highlights individually; it just doesn't pass my test of a really good episode and I’ve ranked it at 119 for part 2 and 118 for part 1. I guess I didn't notice the guards as having an "accent". They just spoke as if they were scared to death of Morgana....as I was! And I thought the guard's execution was pretty amusing but I guess I can see how others would find it too dark. I guess I fail to see why the name reveal is such a big deal. Surely the reveal of the mystery in invisible killer was more exciting than MacGyver's first name. The only redeeming quality of this episode is the costumes. Except the dog hat, I think the costume and make up people earned their keep on this episode. For the diehard fans who saw this episode when it came out, the name reveal was an enormous deal, and we knew it was coming based on the previews which made it even more exciting. Al mentioned how he already knew the name when he started watching and so the reveal lost some of its luster, and I can understand that. For this episode to be truly taken to heart then it is clear that you had to be watching the series when it was first shown. There is no denying that the revelation of MacGyver's first name would have been a really big thing for those who had become long term fans and followed the series from the beginning. Unfortunately, starting to watch in 2015 didn't give me a chance of avoiding something as important as MacGyver's first name and, like Al said, that did diminish the moment that really makes the episode for Nick and Mark. There was lots to like about the intriguing plot and the way everything tied together back in reality at the end, but it was difficult to escape the surreal and silly when seeing Pete as King Arthur or a guard dog that looked like a court jester for example. I have mentioned before that I really liked Passages and the way it achieved the dream sequence story with a lot of heart and soul whilst Serenity strayed into comedy but with some clever links to the real world and MacGyver's Women took it further into the ridiculous. I think that Good Knight MacGyver sits somewhere in between but perhaps verged too far towards a silly portrayal of Arthurian legend. This is the episode I remember of MacGyver. I would have started watching it in the last 2 seasons way back when ....and when I began rewatching this year...after the start of the new MacGyver, I realized there were many episodes that were totally new to me. Although pieces of many seemed familiar....but when I remember MacGyver from my days as a kid, this is the episode that always comes to mind. So, having arrived at it now, I can say that I enjoyed it just was much now, as I did back then. It was just what I needed after a long frustrating day at the office. A good hour of fun, great MacGyverisms, and tons of laughter. Glad you enjoyed this one as much as you did before -- it's a classic! These episodes are a version of: "who do you think you are" and "Back to the future". I like these two episodes, I think the episodes are funny, even with a grumpy MacGyver, production was good and the actors excellent. The story is silly, but that's how must dreams are, aren't they? I couldn't think of a better way to reveal MacGyver's name, it makes complete sense for me that they had to go back in time to reveal a name that in these days it could only mean meat. I enjoy these episodes. Almost done. I just caught a rerun of this episode and immediately checked the web for any info I could find. It was great reading your excellent analysis! I was never that much into MavGyver as a kid, I preferred stuff like Knight Rider or Star Trek: TNG. But I vividly remember randomly tuning into a late-night rerun of this episode on German TV during a school holiday in maybe 1994 or 1995. I was immediately enchanted and couldn't wait for the next day for part 2. This is not only my favourite MacGyver episode by far (though I am sure I haven't seen them all), it is one of my favourite episodes of any TV shows ever. The premise is so creative, the acting wonderful, the juxtaposition of old and new is funny, and the music, oh my, the music! This remains a magical poece of television for me, and I am very glad that others still love it, too. Since I was behind iron curtain when the episodes first aired (well not these ones particularly but it took some time to get the imports here) I only became a MacGyver fan later on when we got the episodes syndicated on TV. It must have been around mid to late 90s. I remember I caught up some of those "Just call me MacGyver" scenes and I knew by then he doesn't want his first name known. And since as I mentioned we got MacGyver on syndication we never got any "bonus" material such as interviews and stuff that would foreshadow the episode content. Heck they didn't even show the episodes in order! It was thus a huge surprise for me seeing this double episode (I think they aired two-parters back to back) and just getting a completely unexpected name reveal bombshell! For me this episode was one of the best in the series because it was clever and because of the completely unexpected name reveal. I just finished rewatching it (and first time in original English as we only got overdubbed ones on TV) and it brought back memories and I was still excited about the name reveal even though I saw it coming. By the way I know I'm pretty late to the party even though I first noticed this blog maybe two years ago or maybe even sooner but I still wantd to drop my 5 cents as a viewer and fan from behind the big pond (and a post-communist country as well). By the way, my love for swiss army knife that I've been carrying for some time now comes from this very show. The show also ignited my love for mechanical stuff, helped my imagination and kinda validated an out-of-the box thinking a la MacGyverisms (and I know I made a few of them over the years when situation called for it). I was growing up with MacGyver (I was around teenage years when I watched the show) so I actually connect on more levels than just a TV fan with the show as it helped me realize there's merit to being an oddball with wild imagination. So there goes, it's a much longer comment than initially intended but I like your work here Nicolas and I also read all the comments (Mark, Highlander and others). It's actually insightful for me since as someone not familiar with North American settings I found some things surprising (like your constant bashing of Vancouver as standing in for LA - I would have never guessed since I had no idea Mac was supposed to be based in LA and how LA is actually supposed to look like). Good stuff, thanks for reading and sharing!